The 20th of March marked the first day of Spring, and with every new season comes... NEW FASHION! If the following clothing styles match what's in your closet, then you're all set for a stylish spring. If not, well, you have some shopping to do. Up, down, thick and thin, both men and women will be hitting the streets this Spring wearing stylish patterned apparel. 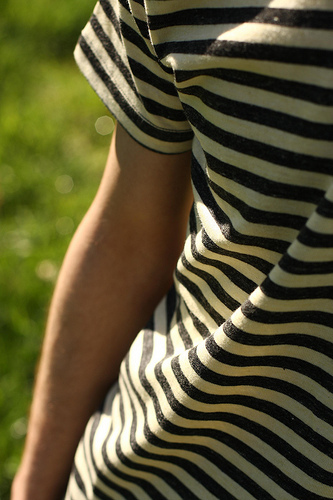 Whatever direction your stripe, you'll be wearing them in style. Now that there are "all-over" presses for oversize printing, create your very own striped pattern and have your sorority, summer camp, or senior tees custom printed! Whether you're on a run, on a bike, or on a couch, performance apparel provides you with an extreme level of comfort. Wrinkle-resistant, smooth feel, and stretchy fabric are just a few of the reasons that this sporty style is desired by men and women of all ages. Performance fabrics can be found in anything from long-sleeve, short-sleeve, tank tops, jackets, and more. You've got your game face on, now get your team gear on. Screen-print some warm-ups with your mascot and personalize them with a name and number. You'll need to be cautious when considering screen-printing on polyester. Be sure to stick to light tees with dark prints.